LG says now is not the time for Apple iTV | What Hi-Fi? Korean electronics giant LG says now “is not the right time for Apple to enter the TV market”. As rumours of an “Apple iTV” continue to swirl, LG has warned Apple of the potential problems and pitfalls of the television market, pointing to the tough market conditions and complex procedure and skills required to make a smart TV. There may be plenty of truth in how Mr Lee responded when asked about the possible threat of Apple TV, though there is also no doubt LG would rather Apple didn’t disrupt an already ruthlessly competitive TV market. MORE: Apple iTV to be an OLED? The company also admitted, in a briefing from the home entertainment division, that existing smart TV offerings still fell short and promised improvements – and even a new platform – in the very near future. Last year, the home entertainment division of LG brought in $20.2 billion in sales, selling some 20 million TV sets worldwide, 15% of the TV market share. And it wants more. The company has laid out bullish aims to increase its market share to over 25% by 2015 in the three key TV areas – 3D, Smart TV and £500+ sets – chasing down great rival Samsung in the process. LG sees the midrange to premium end of the market as a key growth area in the next few years, aiming to increase its sales of bigger screens at higher prices. 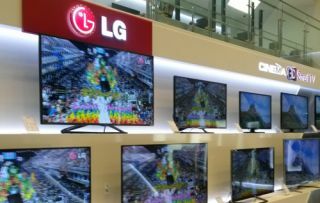 The launch of OLED TV and soon 4K Ultra HD TVs, will, LG hopes, ensure the brand is seen as a technology innovator and leader, though of course the likes of Samsung, Sony and Panasonic all have similar sets in the pipeline. LG Display, the panel production arm of the business, will help in this regard. LG Display makes panels for many other companies, including Apple and Sony. However, LG Display told us Sony would not be using its panels for its smaller 4K Ultra HD TVs due to launch later this year, unlike LG itself, which has 55in and 65in 4K Ultra HD TVs on the way. An Apple iTV, pitched at the premium end of the TV market – and more likely to use a Sharp panel – and sporting iTunes content, iOS apps and more, could make existing smart TVs look not quite so clever. LG admitted this was already true to an extent, admitting “current smart TV falls short”, in the same breath as saying exciting new developments were just around the corner. The company also believed its new Magic Remote, which brings gesture, Wii-style control, would set LG’s smart TV offerings apart from the competiton now that content across all platforms is relatively uniform. LG plans a three-pronged attack on smart TV, with its existing Netcast option – a new version of which is coming for 2013 – joined by new products using the WebOS platform the company acquired back in February alongside continued support for Google TV. Smart TV is seen as key for reinvigorating the TV market, with 3D – more crucial to LG, the company having made a successful stand with passive ‘Cinema 3D' – keeping in the background as a standard feature on most sets rather than a big selling-point. LG claims smart TV activation, based on users connecting their sets to their home network, is over 85% in the UK, well above the worldwide average, which tends to sit closer to 50%. Clearly there’s a level of interest for smart TV in the UK, even if TV sales are are on the wane, with the average TV replacement cycle now up to 9 years. When LG says the TV market doesn’t look so attractive, it has a point. After years of speculation, will Apple finally release an Apple iTV this year? And will it change the market once the same way the iPod, iPhone and iPad did? And would the average consumer buy such a product? One thing seems certain: if the answer to the last question is ‘yes’, then we’ll soon see what LG, not to mention Panasonic, Samsung and Sony, make of it all.